The BMFC flying site is situated on top of a hill known as the Bonchester Heights. You can find it using the map on this site, or set your GPS to N55° 24.366' W002° 41.799'. Coming from Hawick - follow the A6088 towards Bonchester Bridge until you come to the highest point on the road, about three miles South of Kirkton you'll see our caravan on your right hand side, characterised with the flying sites wind sock. Pull over on the left hand side of the road as there is a gate/layby across the road from the entrance to the flying site. BE CAREFUL AS YOU CROSS THE ROAD TO OPEN THE GATE . DON'T FORGET TO CLOSE THE GATE WITH BOTH LATCHES. 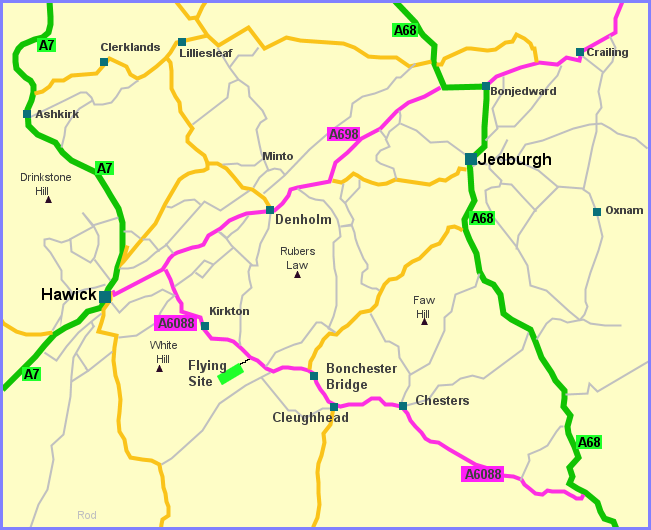 Coming from Bonchester - follow the A6088 towards Hawick until you come to the highest point on the road, about two miles North of Bonchester you'll see our caravan on your left hand side, characterised with the flying sites wind sock. It is safer to carry on down the road and make a u-turn at the next junction to Denholm and then head back South before pulling in to the the layby on the left hand side of the road. There is a gate/layby across the road from the entrance to the flying site. Without stating the obvious, when leaving the site, take great care when exiting on to the main road and please shut the gate locking with both latches. A lead acid battery is fully charged when it reads 14.5 volts + on charge at room temperature. Leave to stand for 24 hours after charging complete and check the voltage again. Refer to table opposite for charge status of battery.